Your team of experts will help you discover your strengths, put your best foot forward in your essays, and get in to the best possible medical school for you. We are proud admissions geeks. We've worked intensely with 300 pre-meds and counting. We know the most common application mistakes pre-meds make and the strategies that work best to help them get in. We regularly speak at med school conferences, and we even write a blog entirely devoted to medical school admissions. 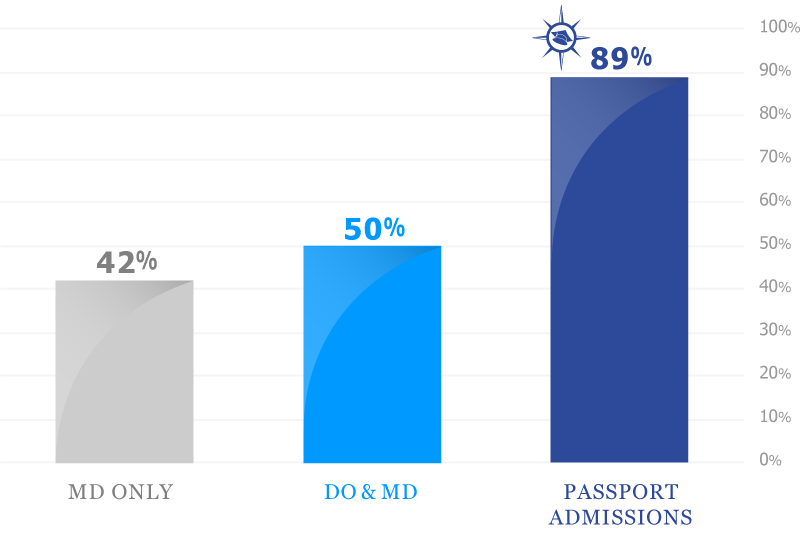 The chart on the right shows the percentage of applicants who get into an MD school (42%), an MD or DO school (50%) and Passport's success rate of 89% (who got into an MD school in the United States). We only work with students that we believe can achieve their dreams, so it's not a huge surprise that they are able to get in at such an exceptional rate. But we also know the tips and tricks of the application process, and we're able to help our students learn to articulate what makes them unique as applicants, to help them get in above and beyond where their stats may predict. Get into the best possible medical school for you. Passport has a proven 7-step application process that has worked for 300 pre-meds and counting since 2007. Our first step is an introductory meeting to help you figure out where you have a chance of getting in. We'll talk about your goals, your stats, and your questions about your application. We'll also see where you may need help and whether we might be a good fit to work together. Meet with us today. We've found the best way to make sure students are 100% ready to submit is to have a mock admissions committee, led by the most senior member of our staff - Passport founder, Rob Humbracht. He will read every word of your primary to make sure it represents you well so that you can submit with confidence. Applications are accepted on a rolling basis and each application is reviewed individually. Click to Apply For A Scholarship.